Health Professionals around the world made the decision to partner with us on our shared mission of making the world a healthier and happier place. 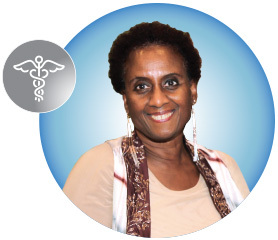 We recently sat down with Emerald Director and Director of Nursing, Barbara Chichester, R.N. to discuss what attracted her to NeoLife, how she overcame her fear and how after 26 years in this business she is even more committed to ending the trend of sickness. NL: How were you introduced to NeoLife? BARBARA: Bob Pearson did a presentation on Cellular Nutrition at a Rotary Club event that I attended. As a nurse, the topic of cellular nutrition was something that piqued my interest. I asked my boss to allow a similar presentation at my office with other staff members and that’s when I signed up to join the NeoLife Family. NL: When did you know NeoLife was the real deal? NL: What were your initial feelings towards the business opportunity? BARBARA: At first I was afraid to do the business. I thought it was sales and I just didn’t know where to begin. But since being on the Success Team, my eyes have been opened. The business is so exciting, it’s really just sharing. I started feeling more comfortable, and reading more and it changed my mindset. It’s still a fear of mine, but I’ve discovered how to overcome it for the bigger picture, to change lives. NL: How has becoming a Promoter impacted your life? NL: What’s an obstacle you face as a Health Professional? BARBARA: Empowering individuals with the confidence that they don’t need to know all the science to share the products. It helps to have a medical background but it’s not critical to your success. Sharing the products comes down to listening to a need, building the relationship and simply offering a solution. NL: How would you compare nursing to changing lives through NeoLife? BARBARA: As a nurse, there is little we can do when someone is in a chronic state of illness. I thoroughly enjoy my service as a nurse, we are the first line of defense—but I can’t wait to work my NeoLife business full time. I have over 30 incredible nurses in my team, and we can all attest to the fact that NeoLife is the vehicle to end the trend of poor wellness. NL: What are your goals for the future? BARBARA: My ultimate dream is to work my international NeoLife business full-time. I would love to spend 6 months in my home country, Grenada, and travel for 6 months. I’ve also always wanted to build a state of the art nursing home in Grenada. My mom currently runs one there but it is outdated. And NeoLife is going to turn these dreams into a reality. For any entrepreneurs out there who have a passion for sharing good health… NeoLife is also redefining the world of startups. Put simply, it’s like a tech start-up, but with nutrition. There’s low barriers to entry because NeoLife provides the infrastructure that any successful business needs, as well as consumable products, and a compensation plan. So instead of having to raise hundreds of thousands of dollars to get started, it makes entrepreneurship accessible to everyone. When you become a Promoter, you own your own NeoLife business and it can be passed down as an income generating asset to future generations.